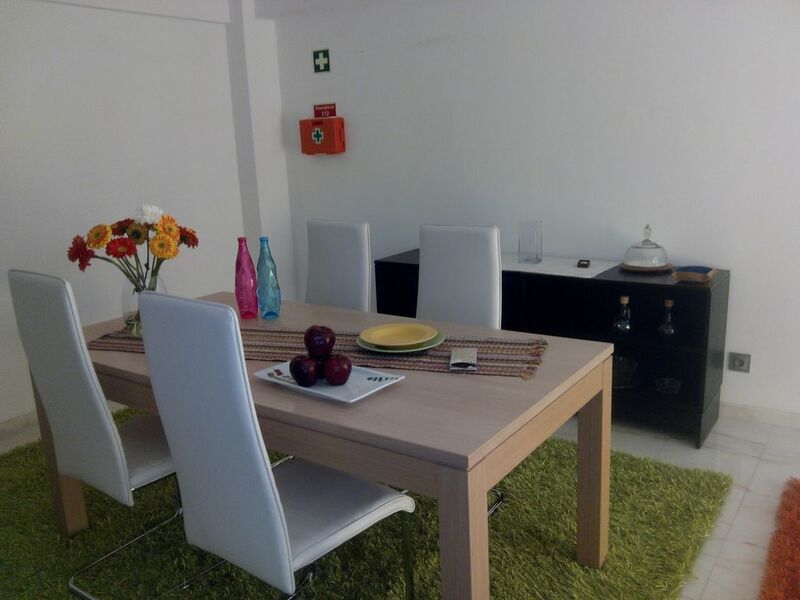 You have just found the apartment you want to see in Faro and the surrounding region. This beautiful apartment with two bedrooms, a bathroom, pantry, kitchen and a magnificent room has even two fronts with balconies. It is furnished and equipped for four people, with bed linen and towels, with marble flooring in the living room and corridor and wooden (floating floor) in the bedrooms. One bedroom has a double bed with a wardrobe and the other has two single beds and a wardrobe. You can use a removable side guard in one of the twin beds. Although the apartment is on the avenue the rooms face the rear porch allowing plenty of peace. In the bedroom's wardrobe you can store valuables in the small safe - please note that we are not responsible for theft. The room features a table with four chairs, a sofa, cable TV - 42 "plasma - and free Wi-Fi with a speed of 100 Mb. S that you can enjoy while sipping coffee on the front porch overlooking the avenue. In the kitchen there is an induction hob, fridge, dishwasher, microwave and other small appliances such as a magic wand, as well as other necessary utensils such as pots, cutlery and crockery for your own meals. In the dispensary you will find the washing machine, ironing board, iron and an oven that should be used in the kitchen if necessary. In the bathroom you will find a non-slip mosaic-tiled bath. Placing multiple rugs in addition to providing cozy comfort to all family members will prevent slippage by improving indoor mobility. The accessibility to the building is very good with an entrance with a small difference (5 cm) and a gentle ascent to the two elevators, which makes easy access for people with reduced mobility. The building has security equipment such as fire extinguishers and sleeves and the apartment is equipped with the equipment required by law: extinguisher, blanket and first aid box and respective photoluminescent signage. There is a non-permanent stand-alone block above the output port that lights up when there is a power failure. The entrance door has a security lock with vertical locks. It has a dossier with the appliance manuals as well as summary usage instructions. The building is located in the best area of ​​the city. Within a radius of 300 meters you will find hypermarket, pharmacy, municipal market, main shopping street, guarded parking (not included), police station, municipal library, leisure park, restaurants and cafes, pharmacies, ATMs, etc. At the door of the building you will find a bus stop where the main bus lines go (eg Faro beach (summer) and Forum Algarve). The road accesses are good, allowing easy access to both the exit and the entrance to the city. The good location will also allow you to visit on foot the main points of historical interest such as the municipal museum and the ethnographic museum, as well as the Sé and the surrounding walls and exercise in the maintenance circuit (about 400 meters) or just stroll and revel in a restaurant or bar for a quiet serenade. If you are a nature lover you are in the right place to enjoy the Ria Formosa: a marine environment, classified as a Natural Park, where you can observe birds and other fauna, and which you can access through the various races to the islands of the Faro, Faro and Faro beach from the dock at about 1000 meters from the apartment (in the summer season). Alternatively you can take a tour of the Ria Formosa through one of the existing operators, throughout the year. The bathtub is lined with non-slip tile. On the floor you will find self-adhesive anti-slip tapes. For your comfort we put at your disposal individual packaging of some hygiene products. It has two lifts; the second floor is high since the basement is located at the street level. Beautiful apartment in a residential/business area. Kitchen has all you need including dishwasher, the complimentary bar was delightful, and thank you for the Valentines Day gift, it was delicious! The washing machine was a plus. The towels and linens were very nice and love the non slip bathtub. About a 10 minute walk to restaurants and old town. Be aware of some noisey roosters heard in the bedroom start at 4A and pulling the outside rolling shutters did not mute and also the bar across the front was noisy in the evening but shutting the door the the bedroom suite muted that. The owners Paulo and Maria were so helpful in providing guidance on our stay and thank you for the restaurant recommendation, it was wonderful. The only recommendation would be a french press coffee pot, it was difficult to find the right size pods to fit the coffee machine. Thank you for offering your wonderful apartment. The apartment is well located - supermarkets, the municipal market, restaurants, cafes, Faro old town and marina - all within a 2-5 minute walk. The apartment itself is very clean with excellent furnishings and bathroom. The hosts are superb - meeting us after 9pm, showing us carefully where everything was and laying on a nice set of welcome drinks. The care with which the hosts look after their guests is shown by the easy to follow labels on the appliances in three languages! We really enjoyed having you as guests. We are sensitive to your opinion and we hope you have the desire to return. Beautiful apartment in the centre area, walking distance to the old town and all main areas. Apartment is full of light. Host was very helpful in indicating ways to reach the islands and organized trips. I would certainly return! We enjoyed our stay in Faro and in the apartment very much . The apartment is in a great Location and very comfortable. Paulo and Maria are very nice hosts! We would love to come back here again. On a trip to Faro beach you can visit the nautical center that offers activities such as kayaking and wind surfing. The beach can be reached by car, taking the bus at the stop next to the building door or on the career boat (these options are recommended by the tour, but they only exist in summer). Alternatively there are private dock operators who do sightseeing throughout the year. A visit to the island of Deserta and / or the Island of the Lighthouse is strongly recommended for the beauty of the beaches and natural environment. You will be able to observe many species of seabirds and eventually you will be able to visit and go up to the lighthouse (this is conditioned and only available according to the times established by the Navy). If you wish to take the route to the beach by bicycle you will find near the apartment operators who rent bicycles and scooters (it is advisable to travel through Montenegro and behind the airport - we strongly discourage the route along the normal road). For those who like to join a walk in natural environment, bird watching, we recommend exploring the Ludo, natural reserve of the Ria Formosa Natural Park. In the city there are some points of historical interest and two museums. Alameda Park is 200 meters away and is a relaxing place where you can rest and read a book, since, next to the park, there is the municipal library. At the top of the avenue you will find a small maintenance circuit where you can exercise in a calm environment. For those who like to travel by train a return trip to Vila Real de Santo António will offer beautiful landscapes of the Ria Formosa, as well as a brief visit to that beautiful city. In addition the downtown area has bars and varied restaurants where you can enjoy typical Mediterranean meals.